Etched in history and culture and brimming with stunning architecture, the city of Seville is a fascinating place to visit for all the family. This beguiling city seems to have a fantastic surprise around every corner, including a beautiful green open space known as the Maria Luisa Park. The vast space of exotic trees, fairy-tale buildings, Moorish pools and fountains and vibrantly-coloured benches, is located to the south of the city centre, not far from the river. This half-mile oasis of Mediterranean pine trees, colourful flower beds, orange trees, elms and pavilions, is widely hailed as one of the loveliest parks in Europe. 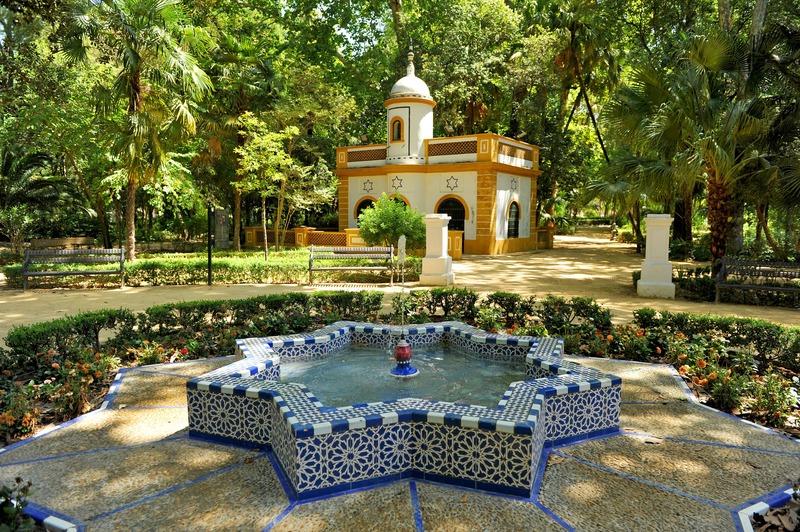 Despite being a popular place to escape the buzz of the pulsating city of Seville, Maria Luisa Park rarely feels crowded and is, instead, an idyllic spot to relax and enjoy some peace and crowd away from the noisy purr of this great Andalusian city. Riding on a horse and carriage is a popular way to explore this beautiful park and take in the immense charm of its wide avenues shaded by the boughs of ancient trees. Or for a more energetic experience of Maria Luisa Park, the hire of bikes is available and is another popular way to explore this beautiful green open space. The park’s focal point is its huge Plaza de Espana, which was erected by architect Anibal Gonzalez. Built for the Ibero-American Exhibition of 1929, this imposing, semi-circular brick building is a must-see site of Seville. The building boasts a Renaissance/neo-Moorish design, with an imposing tower at either end. This mighty Plaza measures an incredible 50,000 square metres. Vibrantly-coloured ceramics are a stand-out feature of the Plaza, alongside ornate bridges, balconies, balustrades and provincial alcoves. Themed tours of the enthralling Maria Luisa Park take place throughout the year but one of the best ways to experience this beautiful place of solitude in a thriving city is to meander around its leafy paths and avenues by foot.